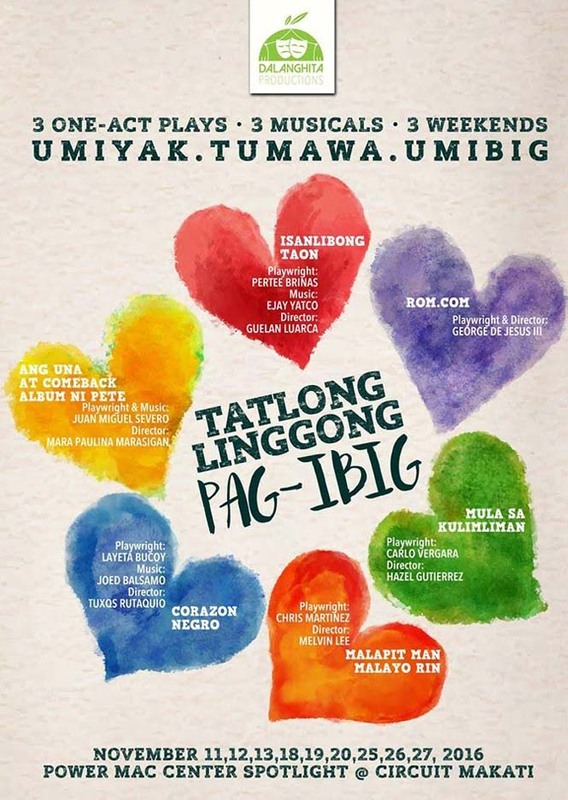 Dalanghita Productions presents its 2016 production, “Tatlong Linggong Pag-ibig”, a three-weekend theater treat of six original one-act Filipino productions in a musical or a play featuring the country’s noted playwrights, directors, musical directors and actors. “Tatlong Linggong Pag-ibig” is set to open on November 11 and shall run until November 27 at Power Mac Center Spotlight – Level 2, Circuit Lane, Circuit Makati, A.P. Reyes Ave., Brgy. Big Carmona, Makati City. The schedule of performances are: Nov. 12 (Saturday, 3pm), Nov. 13 (Sunday, 8pm), Nov. 18 (Friday, 8pm), Nov. 19 (Saturday, 8pm), Nov. 20 (Sunday, 3pm), Nov. 26 (Saturday, 3pm), and Nov. 27 (Sunday, 8pm). The schedule of performances are: Nov. 11 (Friday, 8pm), Nov. 12 (Saturday, 8pm), Nov. 13 (Sunday, 3pm), Nov. 19 (Saturday, 3pm), Nov. 20 (Sunday, 8pm), Nov. 25 (Friday, 8pm), Nov. 26 (Saturday, 8pm), and Nov. 27 (Sunday, 3pm). Sponsors include Taste of my Home (by Tess Cruz) Restaurant, Chubs Chasers, Sikat Studios and Chester Ng Photography.